"SPIRIT DRUM" Drum Supply Cost. 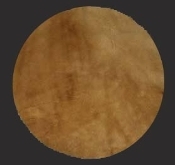 BUFFALO HIDE DRUM SUPPLIES: $180.00 for 18"(not available), or $150.00 for 15". $130 for 13" Please select size of drum preferred. LIMITED QUANTITY AVAILABLE. This item is for SUPPLIES to create your own Spirit Drum. PLEASE NOTE: This is not for a finished drum, but supplies to make a drum in my workshop. BUFFALO MEDICINE: When we seek wisdom and guidance from the Ancient Ones, the Ancestors that came before us, drumming the Buffalo opens the door to that vibration. Buffalo is associated with Wisdom and Abundance and is the source of the Sacred Pipe, as White Buffalo Calf Woman brought the Pipe to the People.When we pray with the Pipe, we are joining the masculine Sky energy with the feminine Earth energy, and whatever we pray for will be given. If we are manifesting from Spirit to Form, drumming with Buffalo is an ally in that intention, reminding us of the connection of prayer (Spirit) to form (Physical).